When you’re a Republican living in California, it’s easy to feel like you’re behind enemy lines. This is a solidly blue state, and while its sheer size and large population mean that, there are entire conservative sectors within it; California remains an unambiguous Democrat stronghold on the national stage – and in our state’s leadership. It seems that our elected officials are so far left that they cannot even be trusted to support the rule of law on many fronts, flagrantly opposing the White House in its effort to enforce federal immigration policy and using their constituents to impose their agenda. California is not just home to tech billionaires, but to working class people who struggle daily to afford their basic needs. Transportation and inefficient infrastructure, housing – Orange County housing costs require at least $167,670 a year to afford even a small house, not to mention that it will not be close to where you work and gas prices have skyrocketed to more than $4.00 a gallon. It is hard to say that anyone in California is as irresponsible and negligent as Governor Brown, Mr. “Build Bridges Not Walls”. Brown uses that phrase in a direct slap against our President. The Governor has invited President Trump to visit our state just to “imagine” what the future may hold when the possibility of “more than a dozen bridges and viaducts” progress? Those things may certainly move forward, but not nearly fast enough or efficiently enough. This is another major failure of Democrat leadership: they squander taxpayer money, and they do so shamelessly. California has been in decline over the years because of inefficient government- in spite of the compulsory tax and spend, incompetent and wasteful administration, many projects languish, while Republicans and Democrats blame one another – instead of getting the work done for the people. After many years of waiting, our “world-class” train system is still under construction, having completed only about 119 miles through Central Valley. The estimated price tag for the project has also consistently ballooned, starting at $5.1 billion and most recently having estimated to a pristine $77 billion. The growth shows no signs of abating. Gov. Brown and Associates has been defending this massive and much-scrutinized infrastructure project in California. His plans to build a high-speed train from Los Angeles to San Francisco’s cost have skyrocketed. “Brown argues pursing the project will still be cheaper than expanding airports or building new freeways.” Billions of dollars in taxpayer money imposed upon Californians while Brown and the entire administration right down to local government have been in office. 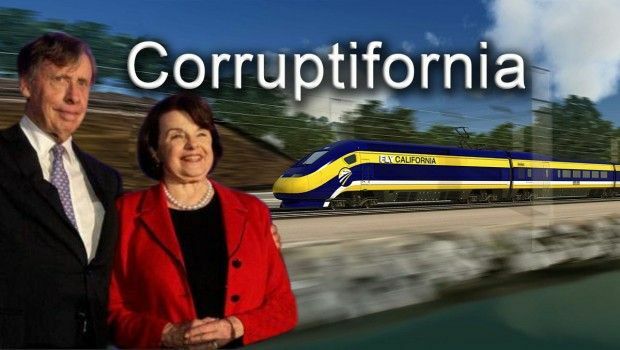 Most Republicans suggests “dumping high-speed rail” just abandon the multi-billion dollar taxpayer funded project, with no suggestion on what to do with the development already underway. They have even suggested swapping the train for water storage. With no realistic way to pay for the completion of the project, it is an irreversible black hole, which more and more tax dollars are forever lost. The culpability of those that hold office in this Golden State and the continuation of spending the taxpayers are at their mercy. The prolongation of high taxes with no infrastructure, no water storage, no preparedness for the next disaster like an earthquake or the upcoming wildfire season, is anyone paying attention? The difficulties in public transit, moving people into the city from where they can afford to live and the importance of bringing much needed water to Southern California has been hampered by state and local politicians. Both of these a disaster in the making and one that we as Californians will pay the price in the safeguard, management, conservation and the protection of our wildlife and the lives of people in the path of the next Southern California Wildfire, which will bring Californians to our knees. California has planned for years to bring water from the north to the south through massive tunnels because it is essential and necessary to Southern California. It is essential important that California become a leading model on how to firefight with “state of the art” technology and communications network. Bureaucrats have faced criticism every year that they continue to fail their voters, fail to notify residents of the risks, prepared communities for the threat ahead of fierce wildfires that plague California year after year. What about our water? Californians passed Prop 1, authorizing $7.12 billion for water projects. That was in 2014; since then, the expenditure has inched up to $7.5 billion, which was to be spent for safe drinking water, water storage, flood management, water recycling, drought preparedness, ecosystem and watershed protection, and groundwater sustainability. These projects have suffered the same fate as every project including transportation as we continue to struggle with the worst drought in our state’s history. This, it seems, is what Democrats do: they lie, flagrantly and often, exaggerating the benefits a project will bring while under-estimating its cost. Given the go ahead from voters or the state legislature, they then proceed to get virtually nothing accomplished – while appropriating and spending vast amounts of money that quickly eclipse what they promised they’d need and scarcely ever stop climbing. The train fiasco, I promise you, is only getting started; wait until construction starts knocking on the doors of the state’s two largest urban areas. Moreover, who knows how much longer our water project will take, spending billions and billions of taxpayer dollars on what should have been a simple, enough plan, while we sit here without enough water? It is, frankly, criminal to tell deliberate falsehoods about expenses and benefits just to get your hands on public money, and then barely use any of it for its intended purpose. Nevertheless, this is right out of the Democrat playbook. As is, it would seem, defying settled law and working to frustrate the efforts of our President when he tries to enforce it. Democrats simply have no respect for the law, cynically abusing it to secure funds and openly revolting against it when they do not like it. Fiscal responsibility and support for the rule of law should not be controversial issues. To conservatives, they really are not. However, certain Republicans and Democrats do not appear to feel the same way, and this is very alarming when one considers the level of power they wield in the great state of California.